Don’t think, don’t reason and for God’s sake, don’t use the gray matter – all that matters is a created world of helplessness and devotion to the state. That’s what they want, that’s what they are working so hard to achieve and why they hate President Trump and his supporters so much. Globalism is the new user friendly term for the New World Order which the left promises will bring us not only world peace (through military control) but equal justice (through international courts), a one world currency (guaranteed to make every country equally poor) and total control over every aspect of our lives. What more could you possibly want? 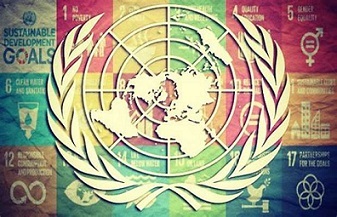 In 2015 we set idly by as the United Nations launched its “new universal agenda” for humanity. Those are not my words – they come directly from the core document for this new agenda. Even Pope Francis traveled to NY City to give his endorsement to the plan. Nearly every nation on the planet willingly signed up for the 17 stated goals included in the plan – goals that promised if we all work together we could turn our planet into some kind of utopia, which according to Paul McGuire, author of The Babylon Code, is designed to lower the standard of living of the middle class so that soon there will be just one giant lower class, the peasants and one super-upper ruling class, the elite. Pope Francis, who blames all the world’s problems on capitalism, and continually calls for a radical “new power” to be “given control in the world,” prefers a one world government and has gone on record praising the United Nation’s Agenda 2030 as an “important sign of hope,” to accomplish this goal. Since the 1992 United Nations Earth Summit, where Canadian mega-billionaire and communist Maurice Strong introduced Agenda 21, which was promoted as a means of protecting our environment, building a better world and bringing in social justice, the exact opposite has happened. Agenda 21 alone created untold economic hardship, mass starvation and disease outbreaks, and aggressively destroyed economic prosperity for billions of people all over the world. Imagine what 2030 will do. Agenda 2030 is, according to Mike Adams at Natural News, a blueprint for the global enslavement of humanity under the boot of corporate masters, a code for a corporate-government fascist agenda that will imprison humanity in a devastating cycle of poverty while enriching the world’s most powerful globalist corporations. It is a push to invade the planet with GMOs and Monsanto’s patented seeds while increasing the use of deadly herbicides under the false claim of “increased output;” the replacement of fossil fuels with wind and solar power even combined these two green energies cannot provide the power the world needs; forced vaccinations for all children and adults even as scientific studies are beginning to question the safety of putting chemicals like mercury, fluoride, aluminum and formaldehyde into our bodies. In addition they would ban most ocean fishing, criminalize the operation of private fishing vessels and place all ocean fishing operations under the control of government central planning; reduce inequality by forcing individual governments and citizens alike to share their wealth by seizing control of the means of production to move towards a more sustainable pattern of consumption and production, etc. In other words, where we live and how we live, the way we eat, how we cook our food, how we work, how we heat and cool our homes, what we drive, etc. are all unsustainable and the world has to learn to live with less because there are too many humans living on the planet consuming too many resources. Can anyone say population control? “Sustainable” children for global citizenship in the new order will be accomplished via what the UN misleadingly refers to as “education.” In the UN document the word “education” alone is mentioned more than 20 times. And throughout the agreement, the UN openly advocates the use of schools to indoctrinate all of humanity into a new set of values, attitudes, and beliefs in preparation for the new “green” and “sustainable” world order, a world order that will preside over the peasants for the benefit of the global oligarchs and their superclass functionaries who already live like the richest kings and queens of the world’s greatest ancient empires. There is no such thing as a benevolent dictatorship. Any government that imposes rule over a majority without the consent of the governed is by definition, not benevolent. Just in the last century, governments have been responsible for the death of over 250 million innocent men, women and children just for the crime of opposition to those that control them. And let’s not forget the billion plus innocent unborn babies that have already been slaughtered for population control.